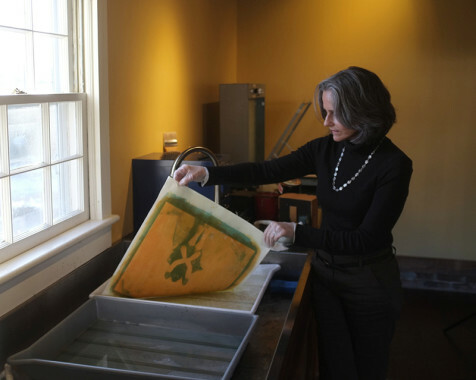 Hear North Carolinian photographer Diana H. Bloomfield speak about her continuing evolution as an artist, including how her use of alternative processes such as gum printing has informed her practice. This lecture on Friday, April 6 at 6:30pm is free and open to the public. An exhibiting photographer for over thirty-five years, Diana Bloomfield has received numerous awards for her images, including a 1985 New Jersey State Visual Arts Fellowship, and five Regional Artist Grants from the United Arts Council of Raleigh, North Carolina, most recently for 2015-16. Specializing in 19th century printing techniques, Diana’s images have been included in a number of books, including Pinhole Photography: Rediscovering a Historic Technique (3rd Edition), by Eric Renner; Robert Hirsch’s Exploring Color Photography Fifth Edition: From Film to Pixels (2011); Jill Enfield’s Guide to Photographic Alternative Processes: Popular Historical and Contemporary Techniques (2013); in Christopher James’ The Book of Alternative Photographic Processes (2015); and, most recently, in Christina Z. Anderson’s Gum Printing: A Step-by-Step Manual, Highlighting Artists and their Creative Practice (2017). A native North Carolinian, Diana currently lives and works in Raleigh, North Carolina, where she received her MA in English Literature and Creative Writing from North Carolina State University. She teaches workshops throughout the country, including at the amazing Art Intersection, and in her beautiful backyard studio. Diana is represented by Panopticon Gallery, located in Boston, Massachusetts.